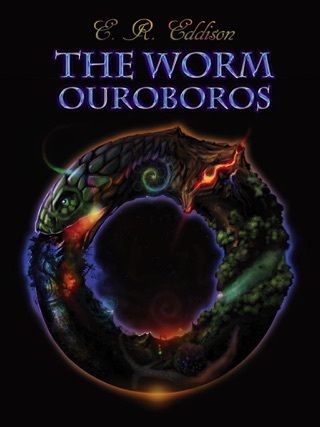 The Worm Ouroboros is often compared with J. R. R. Tolkien's The Lord of the Rings (which it predates by 32 years). 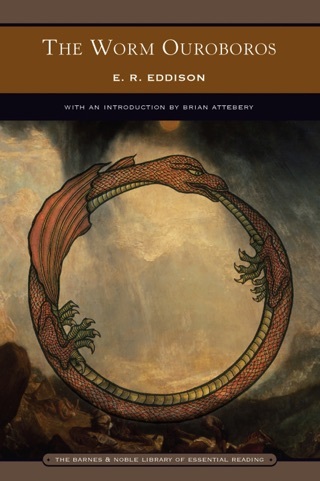 Tolkien read The Worm Ouroboros, and praised it in print. 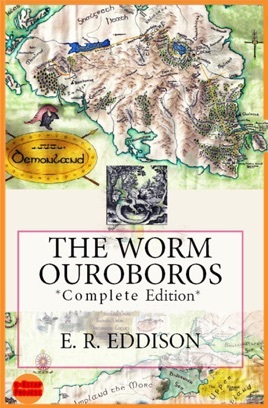 C. S. Lewis wrote a short preface to an anthology of Eddison's works, including The Worm Ouroboros, concluding that "No writer can be said to remind us of Eddison." 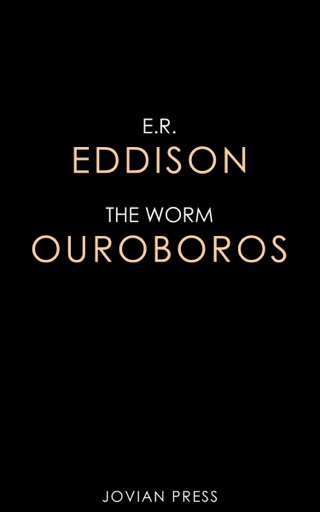 The Worm Ouroboros is a heroic high fantasy novel by Eric Rucker EDDISON, first published in 1922. The book describes the protracted war between the domineering King Gorice of Witchland and the Lords of Demonland in an imaginary world that appears mainly medieval and partly reminiscent of Norse sagas. 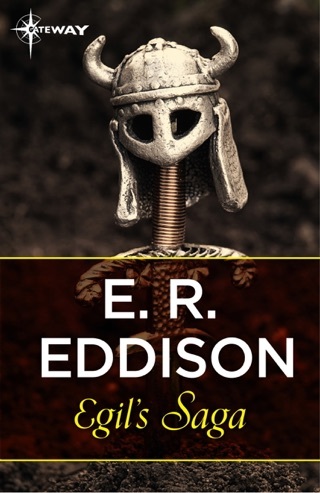 The work is slightly related to Eddison's later Zimiamvian Trilogy, and collectively they are sometimes referred to as the Zimiamvian series. 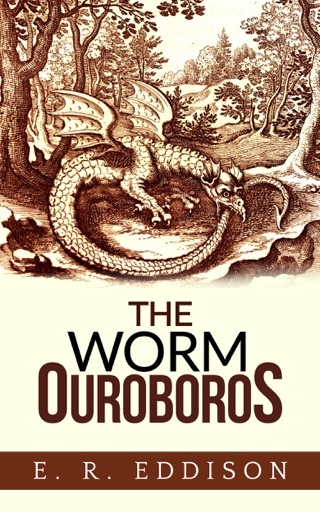 A framing story in the first two chapters describes the world of the novel asMercury, though it is clearly a fantasy version of Earth, a "secondary world"; no effort was made to conform to the scientific knowledge of Mercury as it existed at the time of writing. At a number of points the characters refer to their land as Middle earth, used here in its original sense of "the known world", and the gods worshipped have the names of deities from Greek mythology. Oddly, the introductory framing story, has a beginning, but is not referred to once the actual fantasy adventure begins. (Framing, as a technique, usually opens and closes a separate story contained inside the frame-narrative.) The framing story having introduced the chief lords of Demonland — the brothers Juss, Spitfire, and Goldry Bluszco, and their cousin Brandoch Daha — the story begins in earnest with a dwarf ambassador from Witchland arriving in Demonland to demand that the Demons recognize King Gorice XI of Witchland as their overlord. Juss and his brothers reply that they and all of Demonland will submit if the king (a famous wrestler) can defeat Goldry Bluszco in a wrestling match. The match is held in the neutral territory of the Foliot Isles, and Gorice is killed. His successor (or reincarnation) Gorice XII is a sorcerer who banishes Goldry to an enchanted mountain prison, by means of a perilous sorcery requiring the help of the devious Goblin traitor Lord Gro. While Lord Spitfire is sent back to raise an army out of Demonland, Lord Juss and his cousin Brandoch Daha, aided by King Gaslark of Goblinland, attempt an assault on Carce, the capital of the Witches, where they think Goldry is held. The rescue fails, the Goblins flee, and Juss and Brandoch Daha are both captured. They escape with the aid of La Fireez, the prince of Pixyland and vassal of King Gorice, who helps them at great personal cost because he owes them a debt of honor. * Lord Juss is the chief lord of Demonland and a chief player in most of the battles in the story. He also leads two expeditions to rescue his brother Goldry Bluszco. * Goldry Bluszco is the brother of the hero and one of the chief lords of Demonland. Bluszco has two brothers, Lord Juss and Lord Spitfire. Unlike his bachelor brothers, Bluszco was betrothed to marry Princess Armelline of Goblinland. * Lord Spitfire is a Demon lord who spends most of the story in De-monland fighting the various Witchland invasions. His chief residence is the castle Owlswick. * Brandoch Daha is a lord of Demonland and the greatest swordsman of the age. After Corinius sacks his castle of Krothering, Brandoch Daha swears vengeance against Corinius. * Lady Mevrian is a great lady of Demonland and the sister of Bran-doch Daha, who is left the task of defending her brother's castle of Krothering against Corinius's army. After a siege, the castle is taken and Lady Mevrian has to fend off the advances of Corinius. She is able to escape only with the aid of Heming and Cargo (Corund's sons) and Lord Gro, who betrays Witchland to help her. * Prince La Fireez is the ruler of Pixyland. Witchland has asserted suzerainty over his land, but he is consistently a Demon ally by way of repaying Lord Juss for saving his life. He dies in a naval battle. * Gorice is the King of Witchland, ruling from Carcë; he is said to be a single king with twelve incarnations. 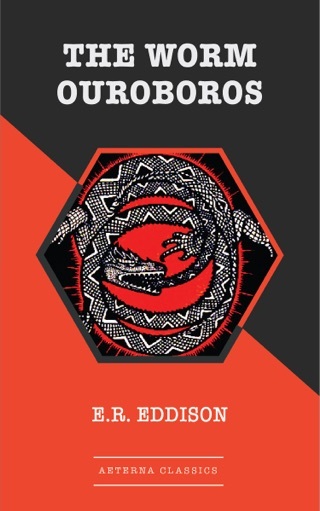 His eleventh incarnation, a champion wrestler, is killed in a wrestling match by Goldry Bluszco; his twelfth, a sorcerer, wears a signet ring in the shape of the ouroboros of the book's title. * Corinius is a warrior leader of Witchland, full of life and ambition. He is an enemy of Demonland, and as warrior of some skill he commands some respect from the lords of Demonland. He is poisoned by Duke Corsus and dies right after the Demons take Carcë. * Duke Corsus is one of the war leaders of the armies of Witchland. Duke Corsus was the chief war leader of Witchland a decade before the story begins. Corsus is wily and skillful but prone to drinking and no longer young. Right before the Demons conquer Carcë, he poisons Corinius, his wife Zenambria, his son Dekalajus, Corund's son Viglus, and Corund's son Heming. Corinius killed him when he realized that Corsus had poisoned him. * Lord Corund is the chief war leader of the armies of Witchland. He is a noble man, a mighty warrior, and has some respect from the main characters. Corund leads the Witchland army against the Demonland expedition to Impland. He is fatally wounded by Lord Juss. * Lord Gro is an advisor to Witchland; later he is an ally of Demonland. Gro is originally from Goblinland and was the foster-brother of King Gaslark before a falling-out. Gro is a famous explorer and wrote a book about his travels through Impland. Gro provides crucial aid to King Gorice XII of Witchland when he summons the magic which carries Goldry Bluszco away. He acts as an advisor and trusted messenger to the King regarding the campaign in Demonland. While in Demonland he meets and falls in love with Brandoch Daha's sister, the Lady Mevrian. Because of his love, he betrays the Witchland army and helps Mevrian escape from Corinius after Corinius captures her brother's castle of Krothering. * Lady Prezmyra is the young wife of Corund and the sister of La Fireez of Pixyland. She is a close friend of Lord Gro, and poisons herself, after the death of her husband and her brother, when the Demons conquer Carcë.